Following in line with the Crash Bandicoot Trilogy, Activision has announced the rename of Crash Team Racing. The new game will be called “Crash Team Racing Nitro Fueled”, and will try and stay true to the original PS1 game that was released back in 1999, but with improved graphics, new character models and online multiplayer. Race online with friends and Crash the competition with online leaderboards With Crash Team Racing Nitro-Fueled, the stakes are high and the competition is fierce. It’s the CTR you love, now kicked into the highest gear. I remember playing the original PlayStation game extensively almost 20 years ago with family and friends, making use of the PS1’s “Multi-Tap” accessory, that allowed four wired DualShock controllers to be connected to a single port on the console. Back then, it was one of very few multiplayer games that supported local multiplayer for up to 4 people on a single (non-flat-screen) television. 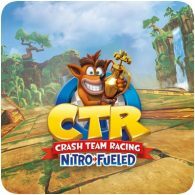 CTR Nitro Fueled is scheduled for release on 21st June 2019 for the PS4.